I don't really know what to call this look except that if I were a stylish pick up truck driver, this is what I would be wearing! I love the baseball cap trend that has come into play right now; it's definitely something I will continue to sport even after the trend dies down. They add the perfect touch of grunge to my outfits. Plus, when I went to the beach last week, my scalp actually got sunburned (such are the problems of having very dark colored hair); which by the way is not fun and I will never go to the beach without a hat again. Nonetheless, I am paranoid about it happening again in the summertime so that is another reason I have been really into hats lately! 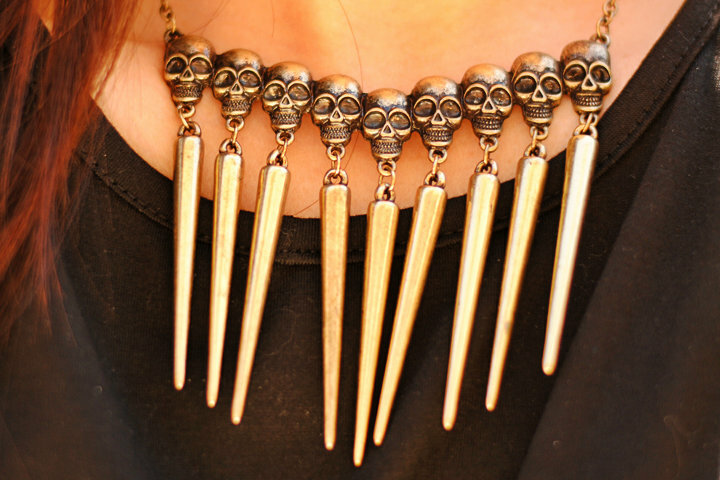 This necklace from Romwe has two of my favorite things: skulls and spikes! :D I think this necklace in particular will look even better when it's worn with a collar, don't you think? I also cut the sleeves off of this Harley Davidson tee, but I've been doing that to a lot of my t-shirts lately. 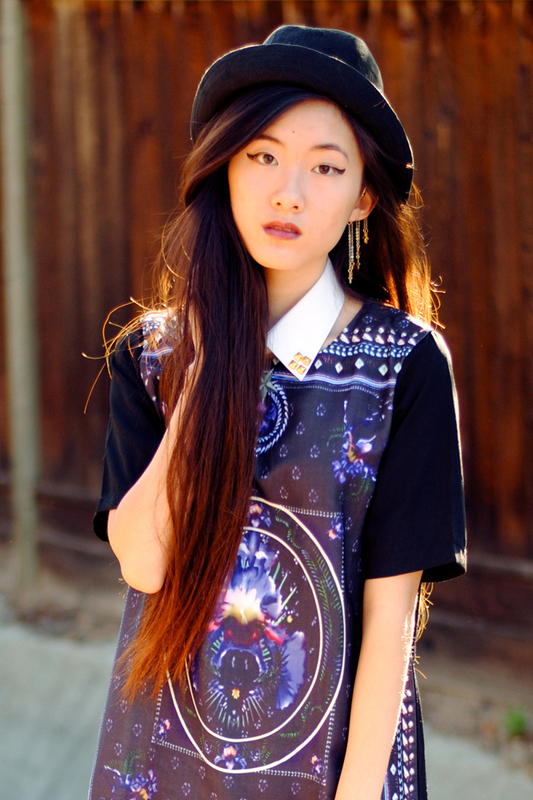 It's a great way to make a baggy t-shirt appear more form-fitting. Hi guys! 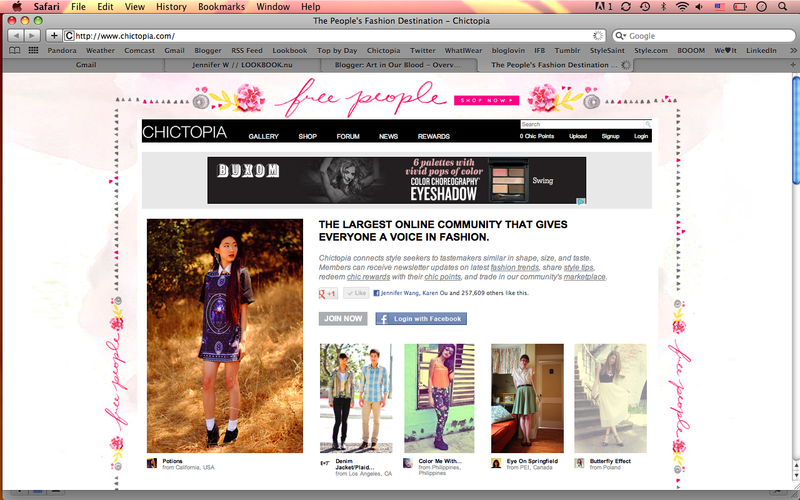 I'm very excited to announce today that I've been chosen as one of the three Chictopia Style Icons for July! :D Part of being a Style Icon is you get to receive 2,000 chic points and $100 to spend in the Chictopia shops! 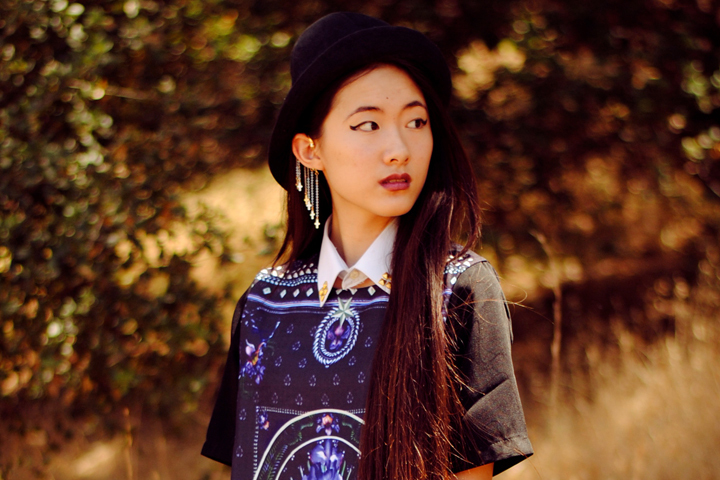 The cool thing about Chictopia is that the points you earn from posting looks, commenting on other looks etc. can be used to redeem rewards. 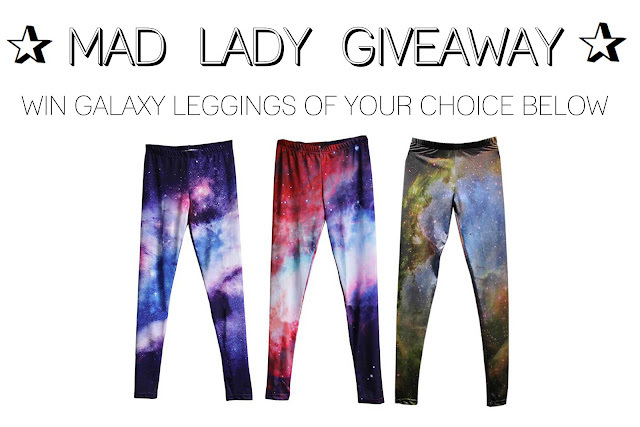 They have really nice rewards too; I saw a pair of galaxy leggings up for redemption recently! Chictopia actually just redid their site a few days ago so you should check it out if you haven't already done so, or make an account if you don't have one yet! 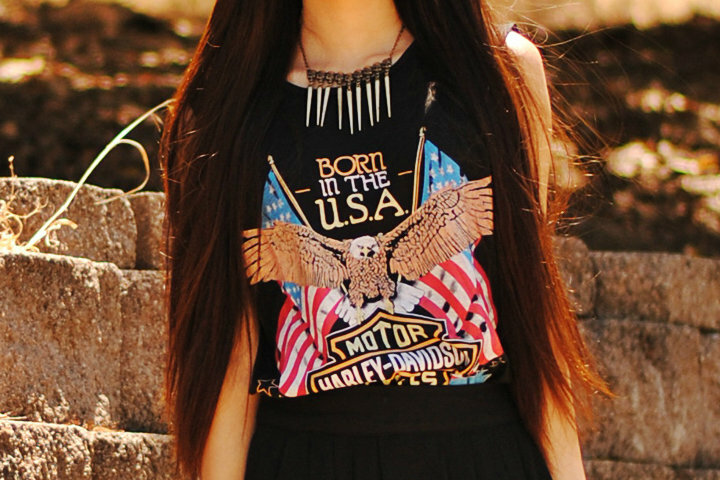 You guys can find my profile here and add me as a friend on Chictopia if you'd like! I'm getting a very grungy and Greaser-esque vibe from today's outfit! I recently have become obsessed with fishnets, fueling my adoration for this mesh sleeved dress from Sugarlips! Sometimes we have garments that are uncomfortable because the seams rub up against our skin but this dress from the Sugarlips "Seamless" collection really does live up to its name! There are no seams in the body of the dress at all; it feels just like a glove. If you want something less dark, you can also get the dress in red or white! In my art classes, I just finished up an abstract tree drawing with cool colors for the tree and warm colors for the background, which was done with chalk pastels. I'm not liking chalk pastels that much (for the moment at least) because my hands keep smudging everything and I can't be as messy with it as oil pastels (which I love). I moved on to drawing a still life in oil pastel of a bowl of fruit. I've been struggling with letting go and using more sketchy lines and freer strokes because the only previous drawing training I had (in Fashion Illustration) conditioned me to avoid sketchy lines at all costs and to draw a single, bold line. But I believe that this fruit bowl drawing is helping me make a smooth transition! I will try to take pictures of my new self portrait, oil pastel cat, and abstract tree tomorrow to show you guys next time! 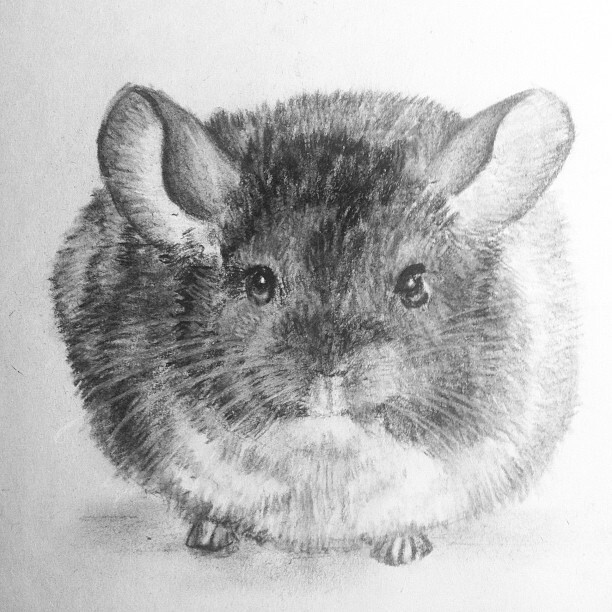 But for now, if you had not already seen this on my twitter, here is a picture of the chinchilla drawing I did using black and white charcoal for my dad for Father's Day! The drawing appears too light on the right side because my lamp was shining on the paper from that direction, but in real life, the values are more balanced ;) Hope you like it! I think he looks quite fluffy. Hey guys! I actually meant to do an outfit post tonight but I have to review my sophomore year Drivers Ed study guides so I can retake my permit test tomorrow since it expired months ago -.- I never really cared that much about getting my license then because I didn't have an immediate need for it. But I want to take care of it this summer. The thing is, I'm more of an introverted person so I prefer staying home to read, draw, sleep, or work on my blog. But after my test, I'll be going to the beach and sleeping over at a friend's house for her 17th birthday. Then Thursday, I have a full day of art classes. Friday, I'll be taking my senior pictures and working on stuff for the side project that I'm doing with Olivia. Saturday, I also have another full day of art classes. I suddenly have the busy, social life I never had during junior year! Hahaha! ;) I'll be gone for a few days but I want to launch this giveaway beforehand. Thanks so much guys and good luck in the giveaway! Giveaway ends on Monday, June 25th. 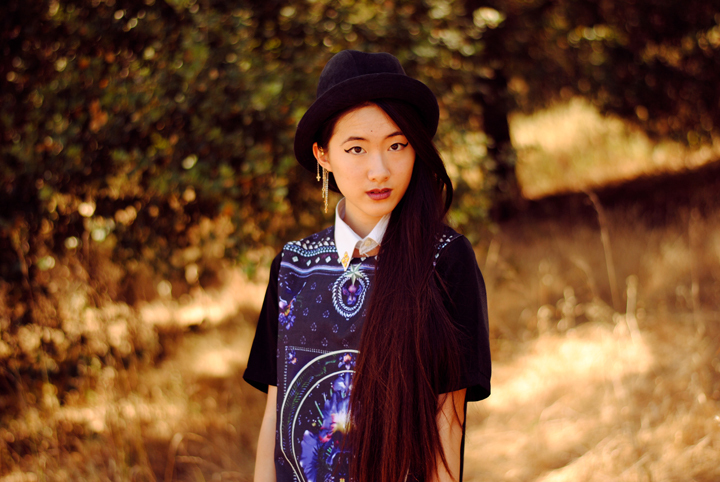 In this outfit, I'm wearing a bat-sleeved cloud print shirt from Sheinside! At first, I belted it to add shape but it was long enough on me that I could wear it as a dress. To add volume and a slight gradient effect, I wore my fuchsia H&M skirt underneath to make the dress poofy and give it a pink tinge on the bottom half :) I also am wearing a new moon and star necklace which I ordered off of eBay for $7 and my spiked headband as a bracelet. I spent most of today at the art studio working on my first oil pastel drawing which is of a cat! It doesn't sound that exciting but I'm very pleased with it and glad to be learning more of the basic techniques of art since I never took actual art classes, only classes in fashion. Today is the day that I have 3 classes at the studio, so I was there for the majority of the day :P I thought it would be a lot to take 8 classes a week but judging by the fact that on my off-days, I'm just at home lazing around, I think I may increase the load to 11 classes each week so I can get work done faster. If anyone who reads my blog is planning to prepare an art portfolio (even if you're not a rising senior like me), heed my advice and get started on it right now, whether it be on your own or through outside classes. Even if you're going into fashion, if you plan to apply to an art school that has other majors other than fashion, you should be prepared to present a fine arts portfolio, especially if the schools you are interested in require a foundation year (and even more so if you want/need a scholarship). I've been told by some of my readers that they appreciate my school/college ramblings so hopefully this is helpful to those who are curious! After posting two softer looks, I'm happy to post another dark look! This dress reminds me of a mysterious potion maker or wizard! 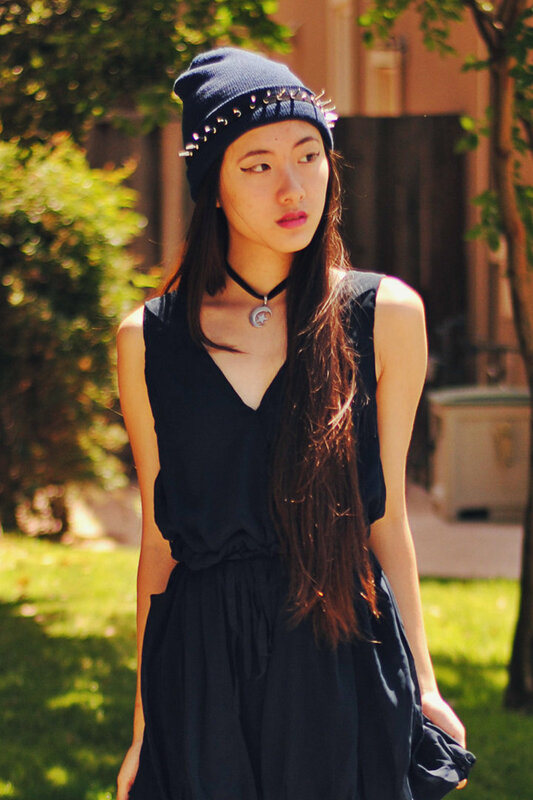 Inspired by Wednesday Addams, I wore my collar with this dark dress, and to add to the dark allure, I wore my black fedora hat. Lastly, I finished the look off with my new cross chain ear cuffs which I am rather obsessed with. You may have noticed that I never wear earrings, which is due to the fact that I don't have my ears pierced, so ear cuffs are the perfect alternative for me. Not to mention, I've been looking for more jewelry with mini crosses. 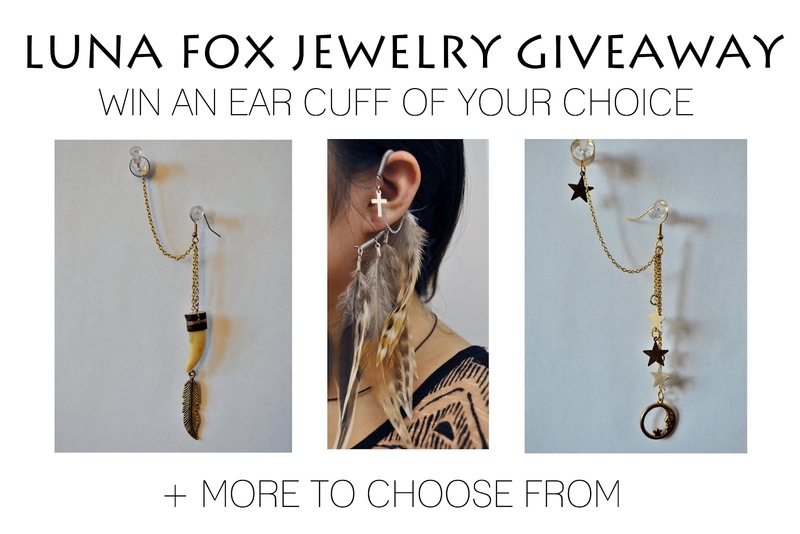 Speaking of ear cuffs, one of my readers, Jessica, had contacted me about organizing a giveaway for one of the ear cuffs which her sister, Nicole, makes herself! I thought it would be fitting to set up this giveaway with my upcoming ear cuff post so here you guys are! Follow the instructions on the widget below and don't forget to check out Luna Fox Jewelry on Etsy to see all of the ear cuffs Nicole has made! 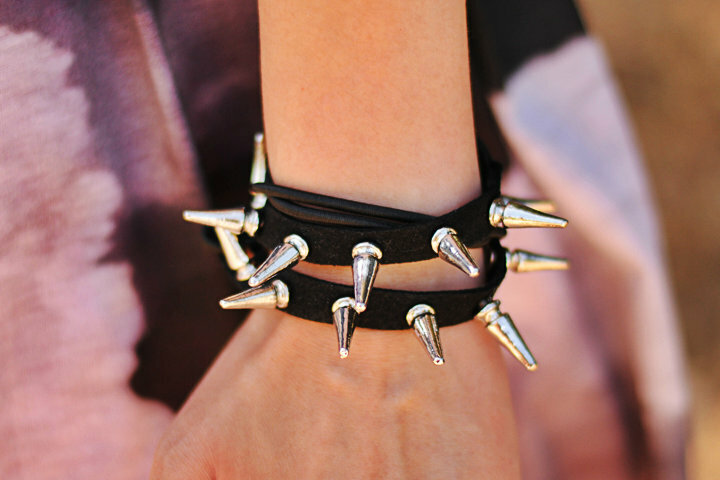 :) There are cuffs that require a piercing but also cuffs that can just hang over your ear like the ones I have! Here, I am wearing a pleated dress also from LOVE. This dress is very airy and breathable, perfect for braving it out in 90 degree weather! Even for fall, I can see myself throwing a white button up shirt and sweater over it and having the dress peek out as a skirt. I accessorized with my collar (you can easily make one by cutting up the collar from any old shirt, preferably a men's shirt since they have structure in the collar) and my cut-out cuffs from Forever 21, one of my favorite finds there! In my art class, I've currently been practicing the basics of drawing eyes, noses, and lips. My very first assignment upon entering the class was to draw a preliminary self portrait, but now that I've been working on refining my technique, I am now working on a final self portrait and all I can say is that the improvement is unbelievable! I can't even believe that I drew it myself... Once I'm done, I'll be happy to share it with you guys! 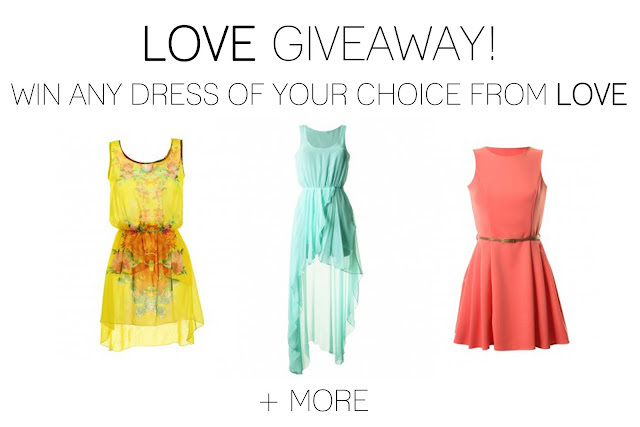 3 days left to enter the LOVE giveaway for any dress of your choice, so don't forget to enter if you haven't done so already! For the first outfit post of the summer, I feel that this look is very fitting. It reminds me of vacation and going on a road trip! Ironically, I will hardly leave the house this summer but being able to sleep in everyday is enough for me to consider it vacation! :P I picked out this tan bowler from Romwe to contrast with my dark hair because almost all my hats are black and tend to blend in. The swan shirt is a favorite of mine which I should wear more often, and the aztec skirt from Love of Eos, is one of the comfiest pieces I own. It's stretchy without being too thin; it feels like it's hugging your curves but it's not suffocating either. For someone who tends to find pants uncomfortable, this skirt is the equivalent of my pair of sweats. In the past, I would only buy garments with prints or bold colors but as of late, I've become more appreciative of simplicity accented by cut and silhouette. The front of this dress looks like a basic flowy, shift dress. I'd normally pass these dresses by as I'm shopping but what really caught my eye was the deep, draped back! Same goes for the skirt; I'd probably flip past it on the rack if it was just another black maxi skirt, but the long fringe makes the garment so much more dynamic! I can admit that because of my habit of passing by more simple pieces, I actually lack basics in my closet (I'm working on remedying this though)! It goes to say that sometimes, less really is more. This outfit is actually composed of a chiffon, shift-style dress that has been tucked into a fringe maxi skirt, so don't be mistaken that it's one piece! ;) I've always liked garments with exposed backs but the drape back is even more perfect for summer, especially if you hate that humid, clingy feeling of fabric in hot weather!